Perugia, the capital city in the region of Umbria in central Italy, near the Tiber river, and the capital of the province of Perugia. Perugia gave its nickname to the famous painter Perugino (Pietro Vannucci), who lived and worked here. Another famous painter, Pinturicchio, lived in Perugia. 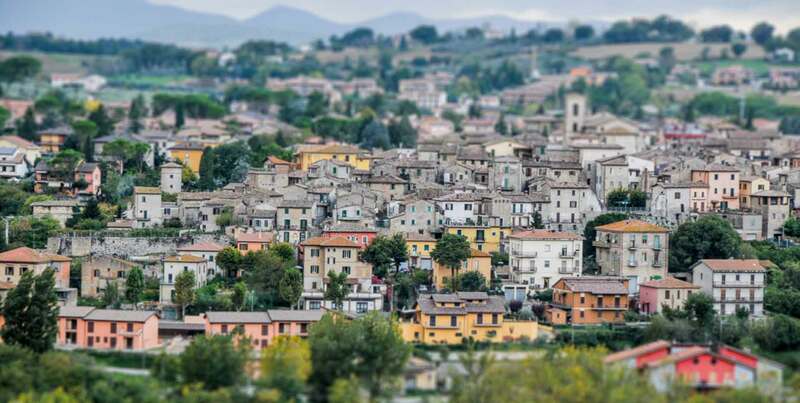 Perugia first appears (as Perusia) in history as one of the twelve confederate cities of Etruria. It is first mentioned in the account of the war of 310 or 309 BCE between the Etruscans and the Romans. It took, however, an important part in the rebellion of 295, and was reduced, with Vulsinii and Arretium (Arezzo), to seek for peace in the following year. In 216 and 205 BCE, it assisted Rome in the Hannibalic war, but afterwards, it is not mentioned until 41-40 BCE, when Lucius Antonius took refuge there and was reduced by Octavian after a long siege. A number of lead bullets used by slingers have been found in and around the city (Corpus inscr. lat. xi. 1212). The city was burnt, we are told, with the exception of the temples of Vulcan and Juno, the massive Etruscan terrace-walls, naturally, can hardly have suffered at all, and the town, with the territory for a mile round, was allowed to be occupied by whoever chose. It must have been rebuilt almost at once, for several bases exist, inscribed Augusta sacr(um) Perusia restituta; but, as we have seen, it did not become a colony until 251-253 CE. It is hardly mentioned except by the geographers until the middle of the 6th century when it was captured by Totila after a long siege. In the Lombard period it is spoken of as one of the principal cities of Tuscia. In the 9th century, with the consent of Charles the Great and Louis the Pious, it passed under the popes; but for many centuries the city continued to maintain an independent life, warring against many of the neighbouring lands and cities, Foligno, Assisi, Spoleto, Todi, Siena, Arezzo, etc. It remained true for the most part to the Guelphs. Perugia has become famous for chocolate, mostly because of a single firm, Perugina, whose Baci (kisses) are widely exported. Perugia chocolate is very popular in Italy, and the city hosts a chocolate festival in October of every year. Perugia today hosts two universities and is a melting pot for students from all over Italy and the world. One of the universities, the Universitá per Stranieri, (University for strangers) serves as an Italian language and culture school for students from all over the world. The city also hosts the Umbra Institute, an American school for students studying abroad in Perugia. The city symbol is the griffin, which can be seen in the form of plaques and statues on buildings around the city.